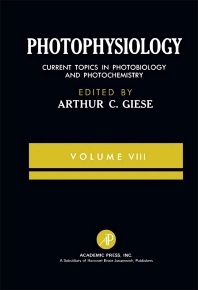 Photophysiology: Current Topics in Photobiology and Photochemistry, Volume VIII is a collection of papers that discusses the photobiological phenomena of plants. This collection presents comparative studies on photosynthesis blending at the molecular, cellular, and plant levels. Some papers also analyze the photosynthesis in the green algae by using genetic methods, as well as the physical separation of photosynthetic system I from system II. One paper discusses the role of cation fluxes in chloroplast activity, including the measurement of ion fluxes in organelle suspensions. Another paper investigates the inter-relationships of photosynthesis and nitrogen fixation in a photosynthetic bacteria. One paper reviews the electrical activities of individual cells and describes the techniques of recording evoked potentials or the minute electrical signals produced from sensory stimuli that are recordable from electrodes attached on the human scalp. One paper considers the inhibitory effects of blue light and near-ultraviolet radiation on the growth and respiration of some organisms. Bio-chemists, photobiologists, photochemists, and researchers involved in plant biology and photophysiology will find this volume highly informative and challenging.